The Facelake FL400 finger pulse oximeter is a lightweight, portable device used for measuring both heart rate and blood oxygen levels or SpO2. Simply place your finger inside the antimicrobial vinyl sensor and have these vital measurements instantly displayed on a vibrant LED screen. Features a battery-saving automatic power off function and a heart rate bar graph. We stand by our products with excellent customer service and a one-year money back guarantee. We frequently sell out of this product. Order now to guarantee availability. NOTE: this product is intended for sports and aviation use only. 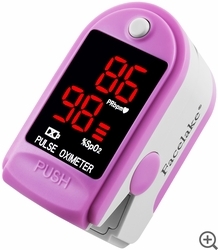 FDA Approved and CE Certified, the FL400 pulse oximeter is designed to provide an accurate, yet affordable, way for spot-checking blood oxygen saturation levels and pulse rate. Whether you are a physician, nurse, pilot, patient or an athlete, the FL400 pulse oximeter is a reliable travel companion, and comes with a free soft-shell carrying case. Simple operation allows it to turn on and off with the touch of a button, and you can expect up to 30 hours of continuous monitoring on a single set of fresh batteries. Deviation is smaller than +/-1% between value of Oxyhemoglobin measured in natural lighting indoor condition and present lighting sources and of that measured in dark room.